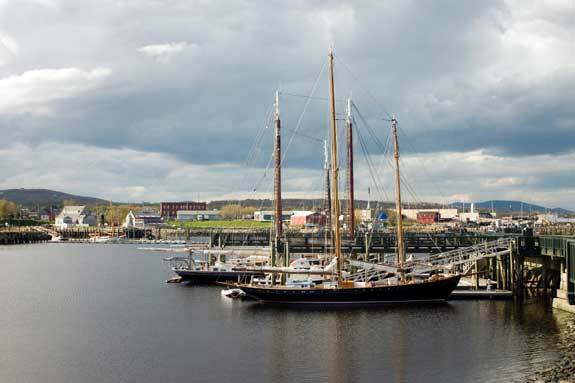 Three masted schooners docked at the harbor in Rockland, Maine. Europeans first explored the coast of Maine in 1524, with the first settlers arriving in 1607. This early colonization of the region created a rich cultural history that must be protected for modern visitors. The National Trust for Historic Preservation has named three Maine towns distinctive destinations, noting their important historic value and need for preservation. These distinctive destinations include Rockland, Bath, and Portland. Rockland is an important hub in the Midcoast region of Maine. The first settlement in the area formed in 1767 to produce timber products. Shipbuilding and lime production were an important part of the early economy in Rockland. Another essential commercial enterprise was fishing, with lobstering remaining highly important to this day. The rich history of Rockland and its well-preserved historic sites makes it a distictive destination in Maine. When visiting Rockland, go down to the harbor to watch lobstermen at work. Each August, the city hosts the Maine Lobster Festival, a five-day event celebrating one of the state’s most iconic foods. Over 20,000 pounds of lobster are served each year. The festival also features cook-offs, live demonstrations, historical information, and music. Walking along Rockland’s downtown Main Street area gives you a sense of the historic nature of the city. Enjoy a traditional coastal Maine meal of fresh seafood, purchase a painting by a local artist, or visit the puffin interpretive center. Rockland also features the Farnsworth Art Museum, home to one of the finest collections of Maine art. Maritime history lovers will enjoy the Maine Lighthouse Museum, which holds the largest collection of lighthouse artifacts in the world. After learning about traditional lighthouses in the museum, visit one of the three historic lighthouses near the city. Consider staying in the Berry Manor Inn Bed and Breakfast, an impressive inn with Victorian charm. The Granite Inn is another historic option for accommodations, featuring the only granite facade remaining in Rockland. Nicknamed “The City of Ships,” Bath remains an important port on the eastern seaboard. In 1607, Bath settlers built the first oceangoing ship in the New World, named the Virginia of Sagadahoc. Its proud history of shipbuilding continued; the town once had over 200 shipbuilding firms and was the fifth largest seaport in the nation. Today, the Bath Iron Works continues to produce frigates and destroyers, extending the shipbuilding tradition into modern times. When visiting Bath, the Maine Maritime Museum is a must-see. 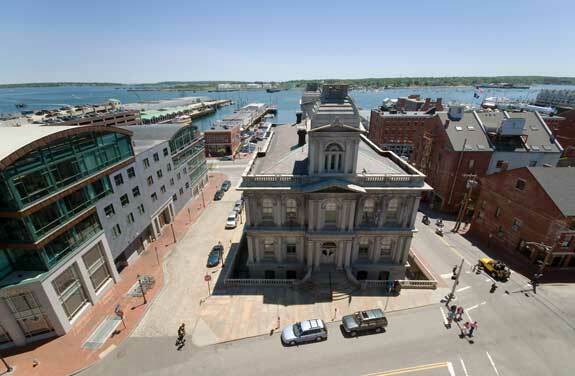 The museum offers tours of a historic shipyard, educational programs, and gallery exhibits. A narrated boat tour cruises through the harbor, pointing out historic sites in the Bath area. Bath residents have worked hard to preserve their historic Main Street. Its 19th-century brick facades and narrow streets are an excellent way to experience old-time Maine. The Bath Historic District features guided tours of preserved homes from the 18th and 19th centuries. If you are more interested in experiencing Bath’s natural beauty, head to Popham Beach, considered one of the most beautiful beaches in New England. Consider staying at The Inn at Bath, a mid-1800’s Greek Revival home within the Bath Historic District. The bustling city of Portland began as a sleepy fishing village founded in the early 1600s. It soon became an important New England commercial center, with a busy seaport, locomotive production, and railroad hub. Today, visitors to Portland appreciate its busy shopping center, incredible arts district, and nearby recreational opportunities. One of the most impressive historic buildings in Portland is the Tate House. Built in 1755 by an agent of the Royal Navy, this home features the original unpainted clapboard exterior, beautifully furnished interior, and accessible grounds decorated in the 18th-century style. The Portland Observatory is another must-see, as the last remaining marine signal tower in the United States. When visiting Portland with children, go to the Children’s Theatre of Maine for a family-friendly performance. The Children’s Museum and Narrow Gauge Railroad Museum are also certain to delight young kids. After seeing the sights of Portland itself, venture into the surrounding area to enjoy a hike or relaxing afternoon on the beach. The Customs House near the Portland Maine harbor.